You’re only seeing things from one angle. That’s a fact Riot are continually trying to remind their most sweary and hostile players of in the tribunal – but it’s also literally true of League of Legends, which presents its 3D world from a fixed point in the sky. That’s beginning to bother players who believe they’re at their competitive peak when fighting up lanes, or down lanes, or speculate they might be at their best when viewed diagonally. Riot are working on a solution for them – but they won’t be freeing the camera from its restraints, an idea that “seems more simple than it actually is”. “Rotating the map is frequently discussed and was even prototyped internally,” wrote a senior environment artist from Riot’s art team. 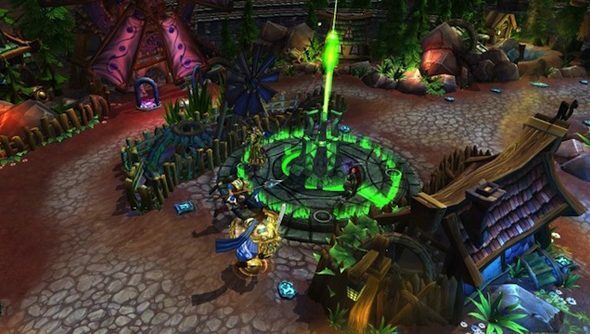 “We abandoned the idea for several reasons, but primarily because the map did not feel as much like [Summoner’s Rift] when we did it. It won’t particularly surprise you to learn that League of Legends is optimised for its single camera angle – but what that means in practice might. Any polygon not facing the camera is deleted in order to help maintain performance. What’s more, the game’s art has increasingly been designed to make the most of the fixed angle. The problems go beyond the aesthetic. Every art asset on a given map is “carefully placed” to prevent characters and effects from disappearing behind it. Rotating the camera without significant work would mean allowing players to hide all over the map, upending the game’s carefully tuned metagame. The developers have “a lot of people” looking into acceptable alternatives to a rotatable camera. Does the current, static angle bother you?